Standing less than a foot tall and weighing a few ounces, the rectangular box doesn’t seem like much but Purdue’s School of Aeronautics and Astronautics hope it will represent the first step for schools nationwide wanting to conduct zero-gravity experiments in space. A few aluminum Launchboxes already have been shipped out this summer and more interest is expected as students return to K-12 schools across the nation, said Steven Collicott, professor of aeronautics and astronautics. Collicott said the Launchboxes allow schools to focus on the experiments they want to send up on private suborbital rockets and also expose students and teachers to Purdue engineering. The 8-inch-by-4-inch aluminum Purdue School Launchbox being distributed by Purdue's School of Aeronautics and Astronautics is intended to help K-12 schools prepare experiments to launch aboard suborbital rockets. In December, Collicott and his students finished a two-year project working with second-graders from Cumberland Elementary School in West Lafayette to send up an experiment aboard a Blue Origin rocket launch to determine whether fireflies could light up in space. Compliments from Blue Origin officials about the box used for the firefly experiment led Collicott to look into possible production. His findings: Launchboxes were so inexpensive that they could be given away to interested schools and other organizations. “We email the schools some computer files for 3D printing the plastic end caps,” he said. “Then we ship them the pre-formed aluminum for the box plus the fasteners and instructions for assembly. Video about the Launchboxes is online at https://youtu.be/TwAIOvMila4. Once completed, the boxes are 8 inches by 4 inches and allow schools to work within the 1-pound payload limit. The boxes are strong enough to support a 15-pound weight to prove that their strength is sufficient for the stresses of the launch to space. The Blue Origin New Shepard rocket reaches space at a height of 60 miles in the air, much higher that any balloon or aircraft. “That flight opportunity is now available to schools all over the world at roughly half the cost of high school football uniforms,” Collicott said. “Any school district in the country that plays football can now afford space flight. The logo sticker included with each Purdue School Launchbox distributed by the School of Aeronautics and Astronautics. “Just like their athletic booster clubs, schools can finance these flights with a “Rocket Booster Club,” he added. 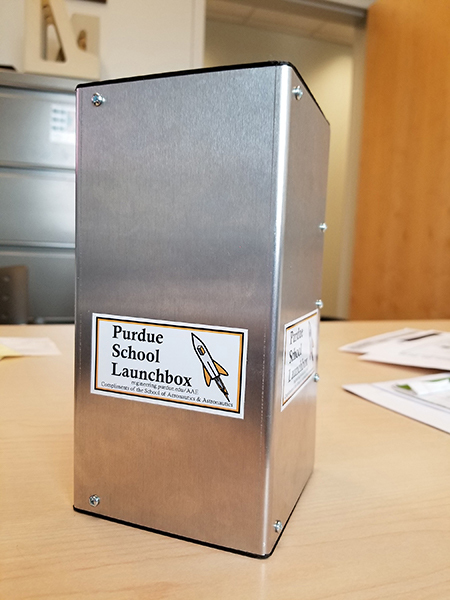 Schools or other organizations interested in getting a Purdue School Launchbox can email Collicott at collicott@purdue.edu and include “Purdue School Launchbox” in the subject line.